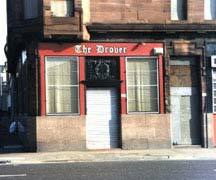 447 Gallowgate, Glasgow. G40 2DX.Tel: 01415541540. 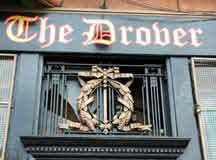 There has been licensed premises here since at least 1845. John Ramsay a well known east end publican took over the pub in the middle of the 1870s, he also owned Ramsay's Bar in Duke Street. The old premises were demolished and a new tenement of flats and a public house was erected on the site in 1912. Thomas Aitken the previous proprietor took over the new pub, his initials and the date can still be seen above the doorway of the pub. The pub was frequented by the many worker of the meat market, the locals called this pub the Spaniards even although the name Anderson was above the door. One of the barmen then looked as if he just came from Spain hence the name. William Anderson traded here for many years, he was also a member of the Whitevale Ward of licence holders. 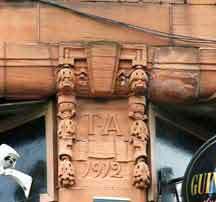 The Date above the doorway T. A, Thomas Aitken, 1912. The ornate iron work above the door entrance at Gallowgate. 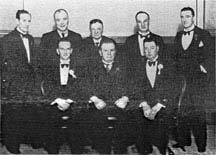 left to right front row William Anderson, Thomas McNulty, Hugh Davis. Back A M Barr, Archibald McCulloch, George Neil, A Palfrey and Archibald McIntyre. 1934.